Sustainability Initiatives: External wall insulation; heating systems; roof insulation; high performance windows. The refurbishment of Wilmcote House has been designed using a fabric first approach in keeping with the Passivhaus/EnerPHit standard. 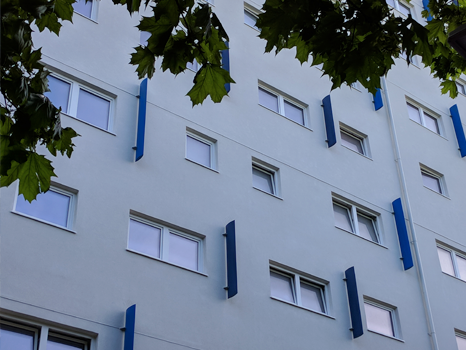 This strategy involved wrapping the existing accommodation blocks in external insulation in a manner that protects the fabric from the weather and external thermal conditions, and provides a stable and comfortable internal environment for residents. The EnerPHit refurbishment standard not only achieves significantly higher performance than current regulations for new build housing, it also ensures the building performs as designed. 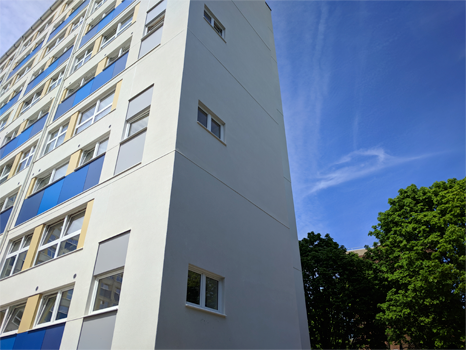 The building has been clad in high quality non-combustible mineral wool insulation and all flats have been fully compartmented thereby preventing the spread of fire between flats both internally and externally.